Blue Bloods begins with Danny (Donnie Wahlberg) and Baez (Marisa Ramirez) arrive at a crime scene where they found a human head at a garbage disposal site. Baez tells Danny to check out the head while they wait for forensics to get there. Danny confirms there was a black hand, but now only just the fingers, which is definitely the calling card; now they will have to figure out why the guy lost his head. Erin Reagan )Bridget Moynahan) is given a file on Jose Cortez by ADA Martin Richardson (Justin Walker White), saying he was charged with possession of half an oz of cocaine; they figure he will get ROR any which way they play it and when Martin says all he could use is a raise, Erin suggests he get in line. Eddie (Vanessa Ray) passes on a protein shake. 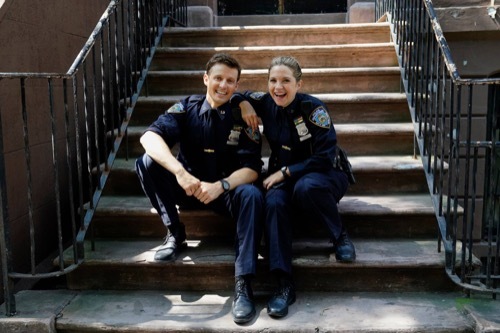 Jamie (Will Estes) feels bad that he has court but quickly learns his court date has been switched and wants to come with her to meet her mother, while she tells her all about Jamie and their engagement; Eddie absolutely refuses. Two NYPD officers are eating their lunch when a gunman comes out of nowhere and shoots them both point blank. Meanwhile, Danny and Baez go to see ME April Watkins (Christine Renee Miller) who reveals the head they found belongs to the body they found on the beach a few weeks earlier, meaning Danny was misinformed and Luis Delgado (Lou Diamond Phillips), the man who burned down his house, is still very much alive. Frank (Tom Selleck) walks towards his office, finding both Sid (Robert Clohessy) and Garrett (Gregory Jbara) solemn looking and informing him about the two officers who were sitting outside a witness’ house and shot inside their patrol car, still in critical condition; one of the officers is Abigail’s (Abigail Hawk) husband. They immediately leave to the hospital, seeing Abigail’s desk empty. Anthony (Steve Schirripa) finds Erin revealing they just picked up the shooter of those police officers and it is Jose Cortez. She feels this is her fault because he had no priors, but Anthony says that his priors were not in their system as his crimes were in Mexico. Anthony reminds her that she followed this to the letter, she suggests he say that to the two cops laying in the hospital. Frank hugs Abigail and sits down, letting her know that Officer Davis is out of surgery and in recovery. She shows him Brian’s department photo and he smiled on purpose because every time you see a cop photo on the front of the paper, they always look so serious and he figured if he smiled it was some sort of guarantee that nothing bad would happen to him. Abigail promised him all kinds of things if he gets better. Frank touches Brian’s hand, saying he is the Commissioner and can’t finish, he says, “Whatever it takes Abigail,” and walks out. Baez doesn’t think Delgado has left town but feels Danny needs to back off the case because it’s way too personal for him. He says if she can’t handle this she should walk away; something she will never do. Jamie meets Eddie’s mother, and things are very tense. She scoffs that he wasted his education only to become a cop, and too bad being a cop is the only thing in the blood because being a doctor or lawyer would give them an affordable and nice lifestyle. She makes fun of their names and thinks it’s going to make for some very interesting conversation at the wedding reception that Eddie’s father is in jail and she is marrying the Police Commissioner’s son. Back in Frank’s office, they talk about Brian and Davis’ injuries, when Erin arrives learns the latest updates on the shot officers. She tells Frank this was her responsibilities and she let him walk. Frank tells her about the felony record in Mexico to which she had no access. She defends her policy is to ask for little or no bail for non-violent crimes and it has its success, but Frank doesn’t agree. Danny finds Delgado’s house, where his wife and children are and orders her to call her husband. Danny takes the phone saying he better hurry up and get home before Danny burns the house down with his wife and kids inside, just like Luis did to his. Garrett, Erin, and Frank hold a press conference about the police shooting, promising to update as soon as they can. Frank reveals the shooter was apprehended shortly after the shooting, leaving it up to Erin to deal with questions about her department’s policies and she still feels it is a success. Frank interrupts the questioning reminding them there are two good NYPD officers in the hospital, one facing disability, the other might not survive; this policy is what caused this. Eddie feels Jamie’s family perfect and all her mother wants is money. Jamie informs her they have family dinner every Sunday because her mother grew up in a poor town with 12 kids and when she moved to New York with his grandfather she vowed to always have a Sunday dinner to prove that they could do it; that meal was so important to her because of how she grew up. He thinks maybe her mother is like because of something that happened to her growing up; but Eddie only has bitter memories. Danny welcomes Luis home, closing the garage door behind him. Danny says he is not going to stop until he finds every single one of those guys who had a hand in setting his house on fire. Luis says it won’t bring his wife back and wonders if Danny is willing to put his sons in danger too. Danny calls Baez, saying he arrested Luis just as Luis says he is working for the DEA. Special Agent Veronica Molina (Lauren Velez) stops the interview saying they are working with Delgado to bring in his boss; she orders him to back off but he has Delgado on murder charges and says that trumps any drug charge. She suggests they work together as its the only way they will get what they want. At family dinner, they say grace but everyone is rather quiet until Danny reveals that the guy who burnt their house down is free as a bird. Nicky (Sami Gayle) says he can always blame the DA as that seems to be the dumping ground around here, she glares directly at her grandfather, Frank. Henry “Pops” (Len Cariou) defends Frank, but Nicky disagrees and Erin feels she needs to defend herself against her brothers too. Sean (Andrew Terraciano) is still stuck on the fact that his dad knows who burnt down their house and didn’t tell him as all the cops at the table feel most of the blame for the NYPD problems does fall on the attorneys. Eddie changes the subject, saying she used to be nervous about how they talk like this, but loves that they keep talking to each other. Erin snips back that Eddie doesn’t have to worry because she will always be golden since she is NYPD Blue. Jamie goes to see Eddie’s mother. She feels good news would have been Eddie getting married to someone who canes give her the life she is used to and that Eddie should be grateful for what they have given her, despite the fact, her father is in prison and her mom insults everyone Eddie brought around. Jamie says he is what’s best for her daughter and his family will treat her well and live a comfortable life. Will that meets her standards? He doesn’t know, but his family will always come first. She doesn’t want Eddie to end up the way she did, not trusting the rose-colored glasses Jamie wears; he suggests she try them on. Erin meets Pop, feeling Frank could have toned it down at her first press conference. She is taking it personally because it felt like he was criticizing her, not the office. Pops reminds her that Frank has to do this because it is his job, but he loves her. Delgado is fitted for an ankle monitor, revealing where there is supposed to be a drug deal tonight. Danny doesn’t trust him and Molina feels this is far too personal for him, explaining to him that the guy they are after killed every single one of her family too; she tells Danny he needs to play by her rules or get off the team! Delgado does the exchange, but he runs the opposite direction and there is a massive explosion and pepper spray everywhere. Danny refuses to give up and runs in the directions Delgado went, chasing him into an empty warehouse. Luis whacks him in the head with a board before hopping on a motorcycle and taking off. Abigail comes to see Frank at his office, presenting him with a Didjeridoo, an Australian wind instrument, It is a gift from the Prime Minister of Australian. Brian is doing better and Abigail came in for a break, revealing they are releasing him tomorrow. She tells Frank to rethink that “no smile” policy. She informs him that she never knew how important his visit was to the officers family until she needed it, thanking him for what he did for Brian. Back at the precinct, Danny and Baez are convinced that Delgado set them up but Molina asks them if that is the case, why is he back at his apartment? All three of them go there, where his ankle monitor says he is. He tells them to come inside, where Delgado reveals that Linda Reagan’s helicopter accident wasn’t an accident at all; they murdered her. He calls Danny a loser and is off to make himself a drink, they hear rustling and its the dog with the monitor attached to its collar. Eddie arrives at her mother’s and finds Jamie with her mother; they are drinking wine and looking at photos. Eddie feels the day will get better if they have a few drinks as her mom talks about all the photos. She tells Eddie if all the boys ran off, they didn’t deserve her so Jamie is the one for her, as he is the only one who came back. Eddie walks up to Jamie and kisses him, saying she loves him. Frank is fishing on the pier when Erin joins him, they talk about how fishing is like being a boss, where there is no guarantee and one slip up and the spotlight is on. She tells her dad that she will always be respectful of him, but she needs to be respectful of her office too. They agree to keep the joint press conference to a minimum, to avoid further conflict.